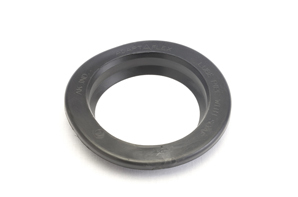 Pipe grommets, also called rubber bushings, are used to seal the connection when a pipe passes through the tank wall. This type of joint is held in place by friction and is less secure and less rigid than a bulkhead fitting. We recommend they be used only for connections at the top of the tank above or just below the water line. The hole size is usually marked on the grommet. Schedule 40 and sewer pipe will require different grommet dimensions. Note: Grommets sold with tank sale only.